Like the name suggests, the Spirit World is where the spirits of the Avatar world reside. This world is opposite of the natural world (where everyone *living* resides) and for the most part, these two worlds do not interact with each other. Only the Avatar can act as a bridge between these two worlds, and use this skill when problems arise between the spirit and natural worlds. However, there are other exceptions. There are two different ways of being in the spirit world. One is when a spirit is in the natural world, and the other is when a spirit (or living being) is in the spirit world. What is the difference? When a spirit is in the natural world, their body becomes entirely composed of shades of blue. They are also semi-transparent, and have a whitish glow around their form. They are capable of passing through solid objects, but cannot bend their element. This is because they cannot interact with the natural world, and the living cannot see or hear them. One exception is that people who have been to the spirit world and back can see & hear spirits in the natural world. Uncle Iroh is one such person. However, it seems that this blue appearance does not apply to the Great Spirits when they cross over into the natural world. Part of this may be because they can actively affect the natural world, unlike normal spirits. But when spirits are in the spirit world, they retain their normal, solid bodies and can interact with their world. It's unknown if benders can bend their element, but creatures with special abilities (like Hei Bai's sonic roar) are capable of using their powers. It's also unclear how living people will look and act when in the spirit world. Scattered throughout the natural world are areas of high spiritual energy that can act as portals between the two worlds. Some of these portals are only active during the seasonal solstices (like the winter solstice), and others... well, who knows. But during these times, it is possible for spirits to cross over into the natural world and the living into the spirit world. 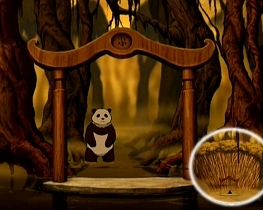 In a destroyed Earth Kingdom forest seen in episode 1x07, Aang and Roku's dragon used this landmark to pass through the spirit & natural worlds during the Winter Solstice. 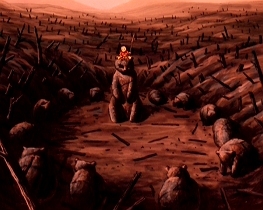 In the center is a large bear statue that is maybe 8-10 feet tall, and is surrounded by at least 12 bear cub statues. Hidden behind the Northern Water Tribe city in the north pole is a warm grassy oasis. Princess Yue claims that this is because this spot has the highest amount of spiritual energy in the entire North Pole. Almost as if the Spirit World had spilled out into the natural world. Inside the oasis is a pond with the two koifish Tui and La, shrubbery, and a gateway with the (ancient) Chinese character for "water" marked on top. This gateway links to a swampy area of the Spirit World. It's interesting to note that the two gateways are mostly identical, and even the same type of bamboo trees grow behind them. Here are the places inside the spirit world that have been seen so far. Seen in episode 1x08, this rocky area is where Aang first speaks with Avatar Roku during the winter solstice in the Fire Nation temple. The last scene of this area shows that they are on top of a mountain. 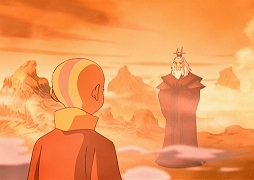 The area is somewhat small, and despite the large bright light directly above them, Aang and Roku's shadows are influenced by the natural world's setting sun. I'm not sure if that's intended, though. 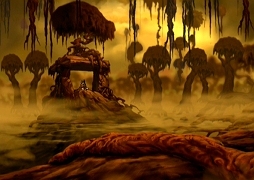 Seen in episode 1x20, Aang reaches this expansive swamp from the North Pole oasis gateway. There are many spirits that reside here including Hei Bai, Koh, and a talking robed baboon. Even Avatar Roku appears to advise Aang. The swamp is filled with trees (planted and floating) and giant lily pads. Further on are high-rising rock formations, and above Koh's tree is a large bright light. 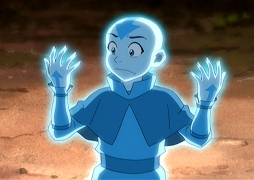 When the Avatar enters the Avatar State, their eyes (and tattoos) glow and they are able to call upon the strength and abilities of all the previous Avatars. 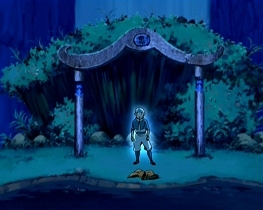 A step up from this however, is while in the Avatar State, the current Avatar acts as a medium for one of the previous Avatars or Great Spirits, allowing them to physically interact with the natural world. This has happened a few times in the show so far. 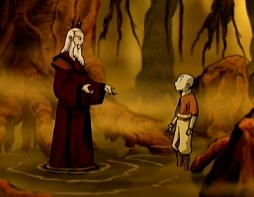 In episode 1x08, after their talk Avatar Roku warned Aang of the danger that awaited him at the temple, and offered to help. When the sanctuary doors opened and Commander Zhao and his men unleashed a massive fire blast, it was Roku who stepped out and manipulated the fire attack back at them, then proceeded to destroy the temple by upsetting the active volcano. 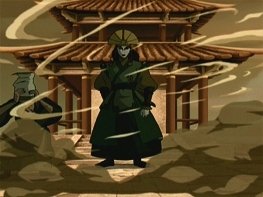 When the solstice ended, smoke enveloped Roku and after it cleared Aang was standing in his place. 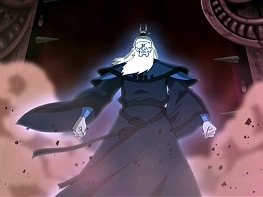 In episode 1x20, Admiral Zhao killed Tui the Moon Spirit (koi fish) while his army battled against the Northern Water Tribe. Aang stepped into the oasis pond and entered the Avatar State and La (also koi fish) soon entered a similar glowing state too. 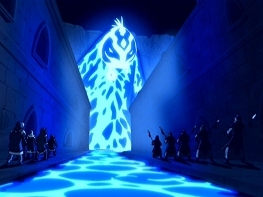 Aang vanished into the water, and out emerged the Godzilla-sized Ocean Spirit, made out of water and light. At the heart was Aang who did the actions, but it was La who was in control. They fought against the Fire Navy soldiers and ships until the Moon Spirit was revived. Afterwards La left Aang on land and took Zhao with it into the depths. In episode 2x05, Aang is on trial in the town of Chin because they believed Avatar Kyoshi killed their leader. In a last-ditch effort to clear the Avatar's name, Aang wore Kyoshi's old clothes in hope that it would trigger something, and it did. Smoke cycloned around him and the area got dark, and when the smoke cleared Avatar Kyoshi stood in his place. She explained her side of the story, then left the way she appeared.